A pretty simple entry for this week's ARF/5-a-day event. Since Pete insisted on cooking dinner for us, I dont have any photographs of the yummy mixed vegetable stir fry he made. He's the sort of person who doesnt want anybody in the kitchen while he's cooking up his magic. This arrangement always works out fine for both of us, and this time I watched Malcolm in the Middle in happy contentment. The taste of this thokku can be varied by adding different spices or herbs... green chillies, red chilli powder, a handful of coriander leaves, garlic, cumin seeds, coriander powder, even 1/2 tsp of toasted powdered fenugreek seeds - all these make for appreciable changes in taste. I wouldnt really advocate using them all at the same time, though. The texture of this thokku can also be a matter of personal taste. You can blitz the tomatoes (before cooking) in a blender for a smooth puree, or chop them up finely and cook them for a more chunky texture. Since I had nothing to do but watch TV, I opted to chop the tomatoes this time - besides, I like my thokku chunky. 1. Heat the oil in a wide pan. Add the mustard seeds, cover, and let them pop - then put in the various powders, curry leaves and fry for 15-20 seconds on high. 2. Lower the heat and add the chopped/pureed tomatoes. Stir well to mix. 3. Bring the heat up to medium-high and cover the pan. Let the tomatoes cook in their own juices till they soften and break down. 4. Once the tomatoes are soft, take the lid off and let it cook, stirring occasionally, till the liquid evaporates and the sauce reduces to a thick paste. 5. Let the thokku cool, then store in a clean airtight jar in the refrigerator. 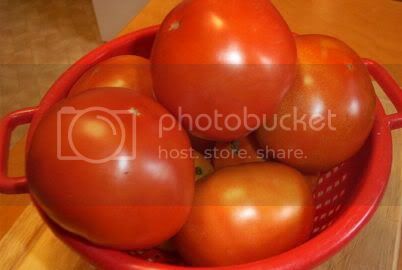 shammi, what a feast to my eyes..Tomatoes and the basket compliment each other :)Nice picture! Hi Shammi... looks red & delicious.. Sorry to post anon - i don't have a blogger account. 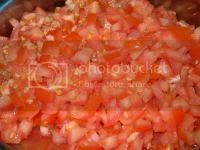 The variation i make is to saute finely chopped onions first before adding the chopped tomatoes and the spices. I love tomato thokku. Personally I like to add fenugreek powder. It tastes great in the thokku. This looks delicious! I have to wait for summer though...right now the tomatoes on very insipid around here. This looks good. I have tried out a similar one , but bit different . 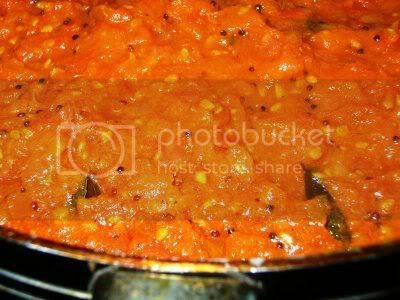 Try out my Spicy tomato Thokku.